Treat your kids to one of these amazing Nashville swing sets this Christmas! 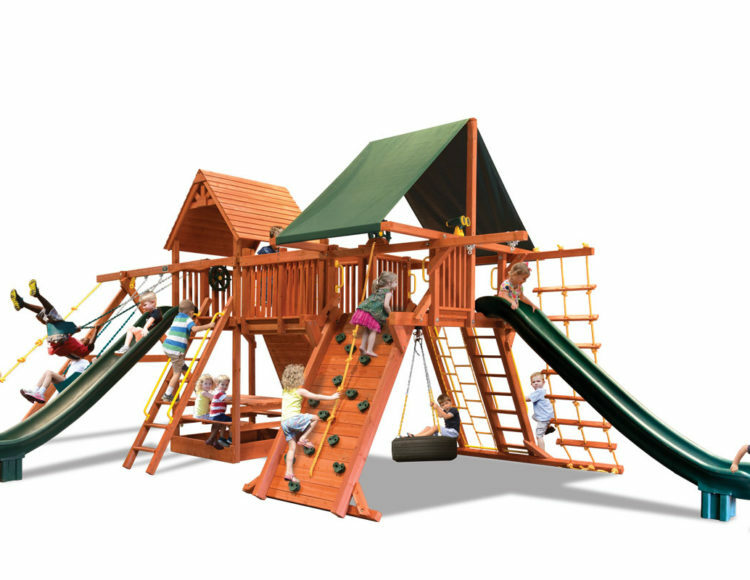 Any park or playground will be a let down after they’ve played on this in their own backyard; they’ll never want to leave home again! The Supreme Dual Powerhouse’s features grow with your child so if you have kids of different ages and want to invest in a swing set that will last your family for their entire childhood and beyond, this is the set for you! Made of 100% all natural premium Pacific Cedar wood, the swing set will splinter less than less hardy sets made of pine or North American timber. Plus solid (not glued) timber and rust proof hardware helps to ensure that this playset will still be safe even after many years of hard play. Dual 6.5 foot high decks anchor the Supreme Dual Powerhouse. A solid wood roof covers one deck while a heavy duty canopy roof fully covers the other. A crawl tunnel connects the two decks for easy flow no matter how many kids at on the playset at one time. Dual 13 foot wave slides provide a fun exit from each of the decks and are great fun for kids of all ages. For those who want a challenge, two rockwalls with attached climbing ropes lead up to each of the decks. For those who want to take the easier route, ladders with hand rails also lead up to each of the decks. The 9.5 foot swing beam provides ample space for two belt swings along with a knotted rope and disc. But with universal attachments for swings and accessories, the options for customization are endless. Plus, swing chains are vinyl dipped to protect small fingers from pinching and extreme temperatures. An accessory arm with trapeze bar adds extra fun while a ship’s wheel at the helm easily lends itself to large childhood imaginations. Underneath the swing set (with a 6.5 foot clearance), a 360-degree tire swing and a 3-in-1 picnic table complete the set’s amenities.